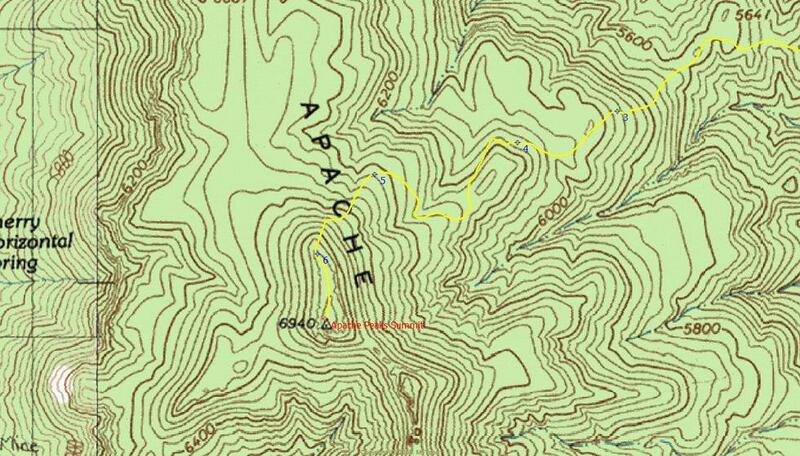 Apache Peaks is a rugged cross-country route. No trail exists. Bushwhacking is moderate to heavy. Sufficient knowledge of topographical map reading and off-trail route finding is required for completing this hike. Approximately 4 miles northeast of the turnoff to the trailhead along US60 is the Jones Water campground. Jones Water is a unique developed campground with 12 small private tent sites along a mature and lush riparian area at an elevation of 4,000 feet. Jones Water is a "non-fee" primitive campground and offers only basic amenities. Use is typically light. Before I get started there is one very important thing that must be mentioned. DO NOT attempt this hike without durable pants. Don't say that I didn't warn you. This is a bushwhack hike from the trailhead to the summit. 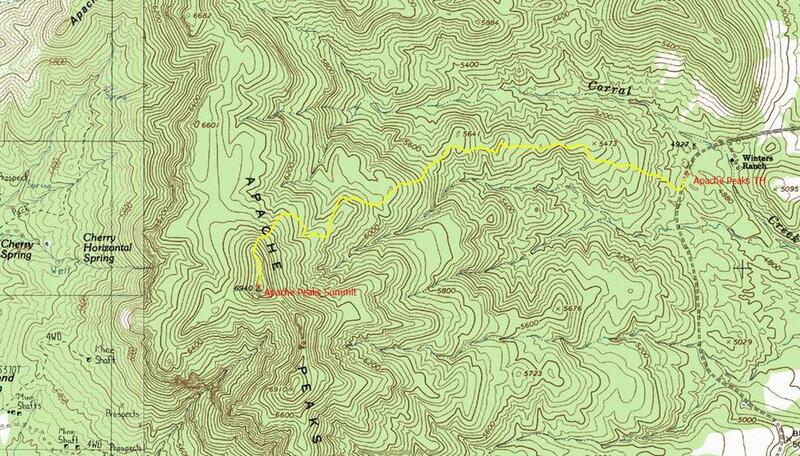 Most of the route is what I would describe as moderate, however some areas are heavy. Utilize existing game trails as much as possible to ease progress. Animals always know the best way through a difficult area. Don't fight the terrain. Slow down and use it too your advantage. The trailhead as posted is at a distinct and obvious parking area along FR584 ("TH" Lat. 33 degrees/32'/50.07"/N & Long. 110 degrees/42'/46.26"/W). From the trailhead I recommend walking about 100 yards to the south along the road before heading up. Much of the route to the summit (see maps) follows an obvious ridgeline with some rolling up and down sections. Unfortunately, one of the nastiest bushwhack sections seemed to be at the beginning. Not exactly the way you want to start things out but that's the way it is. Once you get past the first 200 yards things start to get better. Don't hike straight up to the first rise, but rather stay off the edge to the south, due to vegetation being open and easy to travel through ("Mark 1" Lat. 33 degrees/32'/52.94"/N & Long. 110 degrees/43'/08.15"/W). The next three quarter mile is self-explanatory. Work your way up the ridge while mostly following the crest. There is one high point along the ridge ("Mark 2" Lat. 33 degrees/32'/56.64"/N & Long. 110 degrees/43'/33.34"/W) where you will need to walk a short stretch south while looking very closely for a specific steep and narrow drop where the deer have been traveling through. I initially missed this spot and ended up having to backtrack to look for it. 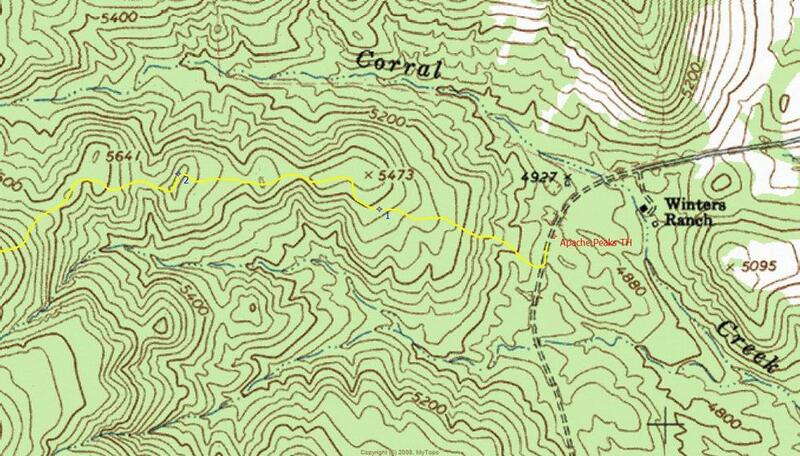 Not far southwest from the 5,641 summit (see map) you will encounter the worst bushwhack segment of this hike. It's a fairly steep slope heading up to a bench ("Mark 3" Lat. 33 degrees/32'/48.34"/N & Long. 110 degrees/43'/57.29"/W). There is no easy way through this part. The manzanita and oak are relentless. It is doable, but you are not going to like it. While you're cussing me all the way through this part, just keep telling yourself how great the payoff is going to be at summit. All of your efforts will be justified. Are we there yet?? It's kind of funny that you can literally see the summit along the entire route, however it seems like you are never going to get there. The good news is that the worst is behind you. Now that you have survived the "mother of all bushwhacks", head across the upper bench (see map) where you will finally reach a nice area of tall ponderosa pine ("Mark 4" Lat. 33 degrees/32'/45.05"/N & Long. 110 degrees/44'/09.80"/W). Pinyon pine and oak are what is primarily along the hike. This stand of ponderosa offered some well-deserved pleasant and open hiking. Along this segment were heavily used game trails working there way up towards the top. Keep your eyes open for the main trail. My route as noted on the map followed this trail. You're almost there! From a noticeable ridge ("Mark 5" Lat. 33 degrees/32'/41.70"/N & Long. 110 degrees/44'/27.64"/W) that follows drainage towards the summit you will finally be heading up the last segment of this hike. The slope is steep yet manageable with mostly oak trees all the way to the top. Just below the top, there is a rock bluff with a perfect crevice to climb up through to reach a sheer overlook on the northern edge of the summit ("Mark 6" Lat. 33 degrees/32'/33.29"/N & Long. 110 degrees/44'/34.82"/W). The view from the tall bluffs took my breath away. In all directions you can literally see forever. My efforts finally paid off. What a location to have lunch. An isolated rugged mountain top that only limited people have ever visited. Very cool! A short walk to the south will take you out onto the 6,940 high point (see map) with killer views of a remote upper basin and a spine ridgeline heading out onto the far summit of the Apache Peaks range. Absolutely amazing. Not something that I will soon forget. 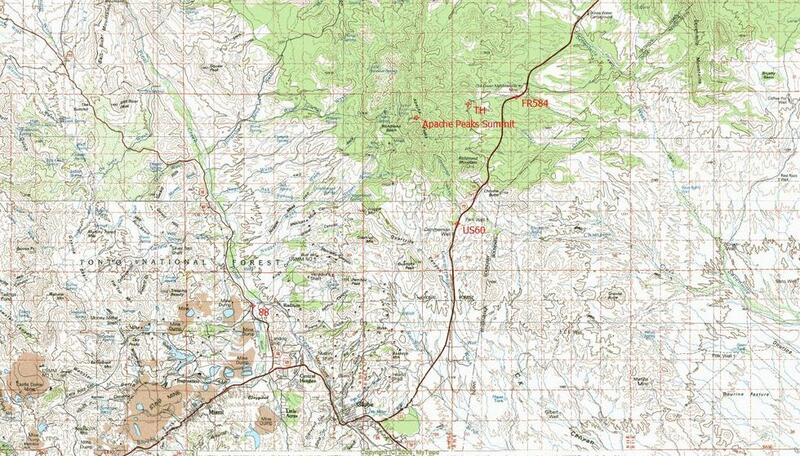 See maps for locations of waypoints described in text. Climbing Apache Peaks seems more like a journey than a hike. The true feeling of accomplishment and solitude is unmistakable. Like many towering sky islands around the state, the views must be experienced in person to truly appreciate. The view from the summit of Apache Peaks is one of the best in the Tonto National Forest. If you're up for a true Arizona off-trail adventure, this hike will not let you down. Count on having it all to your self if you go. From Mesa, take US to Globe. On the far end of town at the intersection of US60 and US70, turn north and continue along US60 for approximately 14 miles to FR584 (Lat. 33 degrees/33'/03.02"/N & Long. 110 degrees/41'/07.89"/W). Drive approximately 1.80 miles to the trailhead parking area (Lat. 33 degrees/32'/50.07"/N & Long. 110 degrees/42'/46.26"/W). Just before the trailhead parking area you will first pass the Winters Ranch on your left and than travel through a gate crossing FR584 shortly after the ranch. Please, always close the gate behind you. You will not be driving through private land to reach the trailhead. Alternative 4x4 Western Approach: 4x4 for sand and other periodic storm related wash-out issues on this approach. Take the US60 to the SR188 in Claypool. Turn left onto SR188 and head north 4-1/2 miles and turn off at Wheatfields Road. Continue 1.7 miles on Wheatfields Road until Hicks Road. Turn right on Hicks Road and follow as it winds northward about 2.3 miles to Forest Road 219. Sign the 'Private Land Access Sign-In Book' and pass through the gate, closing it behind you. Follow FR219 about 1.9 miles where you turn onto FR220. (The FR220 marker is not very noticeable from FR219) Follow FR220 5.8 miles to FR220A. Turn left onto FR220A and park in the open area.